I'm excited to announce the first ever Sports Law and Investigative Reporting course. • Gained an overview of how the law interacts with sports and the reporting of sports. Relevant areas of law include criminal law, labor and antitrust law, intellectual property law, contract law, libel and defamation law, communications law and personal injury law. • Learned the key differences between a collective bargaining agreement, league constitution and league bylaws. • Learned how to effectively obtain investigatory information, including the “best practices” for using the Freedom of Information Act and states’ public records laws. • Developed strategies for advocating for and against “gag orders” in high-profile trials. • Become able to spot legal issues in fact situations involving disputes between and among leagues, teams and players. • Developed crucial skills for interviewing attorneys and agents who represent athletes that are in trouble with the law; general counsel of teams, leagues and sports companies. • Gained insight on how to develop sources, including law enforcement sources. Learned important obligations about protecting sources and reducing exposure to government and law enforcement interested in the information you possess. • Learned how to locate and understand key legal documents, such as complaints, subpoenas, search and seizure warrants, pretrial discovery (exhibits, witness lists etc. ), grand jury transcripts so-called “independent” investigations and accompanying reports, and contracts of players, endorsers, licensors and broadcast companies. • Learned how to competently write, fact-check and vet sensitive stories. • Learned the “best practices” for breaking and commenting on sports law news, including appropriate use of Twitter. Our course is open to law students and attorneys, as well as to journalism students and journalists, and others who are interested in learning how to investigate and report on a news story that involves law and sports. Front office personnel, university athletic department staff, sports agents, crisis management professionals and team and corporate communications specialists may also find significant value in the course. You do not need an affiliation with UNH Law or UNH to take the course. UNH Law is located in Concord, NH (the state's capital) and is about 70 minutes from Boston. 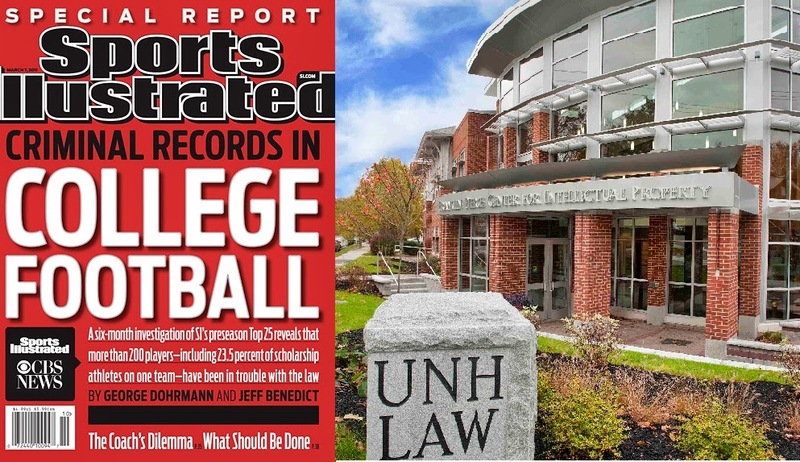 For more on taking Sports Law and Investigative Reporting and other courses offered as part of the UNH Law summer institute on intellectual property and media law, click here. Sports Law and Investigative Reporting is a one-credit course and costs $1,370. Other available courses will include Internet Law, Advertising Law, and Fair Use of Copyrighted and Trademarked Work.